A Look At Iowa's First Majority Hispanic Town Census figures show the Hispanic population in the largely white state of Iowa, while only 5 percent, has almost doubled since 2000. In tiny West Liberty, the mayor says half the local businesses are probably Hispanic-owned. The town's dual language program in schools is also attracting residents from nearby cities. Latinos make up America's largest minority group — more than 50.5 million and growing. 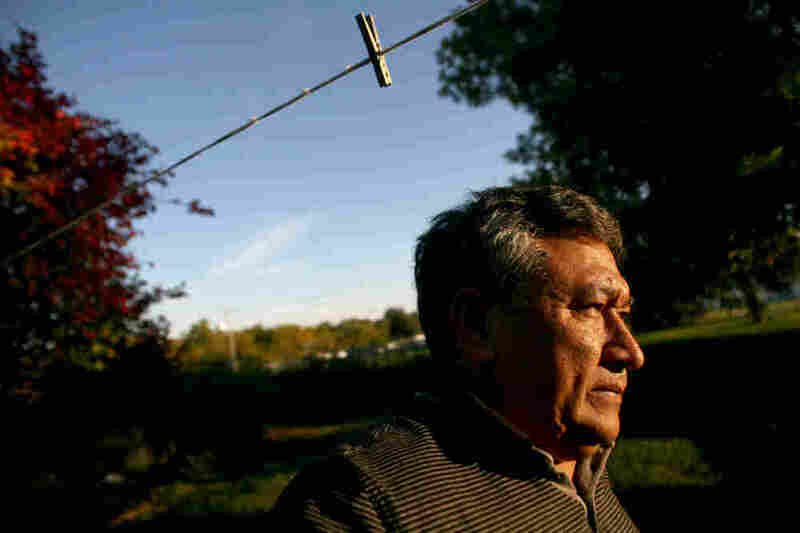 Jose Zacarias lives in an old farmhouse flanked by corn and soybean fields near the edge of town. The Mexican-born immigrant came to West Liberty more than 25 years ago. One place the Hispanic population is growing is in the overwhelmingly white state of Iowa. The latest census figures show the Hispanic population, while only 5 percent of the state, has almost doubled since 2000. 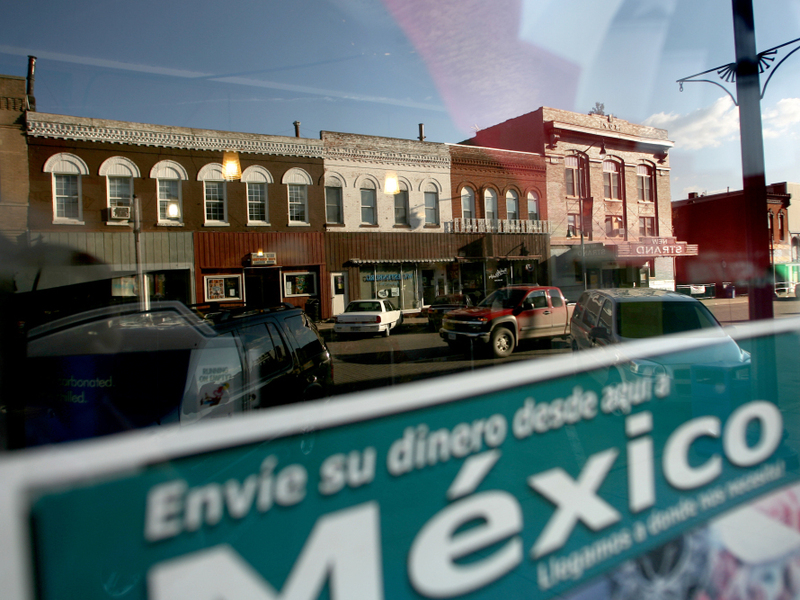 And one small town — West Liberty — is the first in Iowa to have a majority Hispanic population. Sending money to relatives in Mexico is a popular way for families to support each other. West Liberty's East 3rd Street is reflected in this window. Downtown West Liberty, Iowa, is quintessentially Midwestern American, both quaint and historic, with brick buildings lining brick streets. A typical stroll involves walking past the bank, a renovated theater, a hair salon, restaurants and stores. West Liberty Mayor Chad Thomas says that unlike a lot of other small Midwestern towns that are dying, West Liberty is alive. "I see a lot of businesses that are open, and not vacant storefronts," Thomas says. "Probably half of the businesses are Hispanic-owned." Next to Paul Revere's Pizza on 3rd Street is Tienda La Luna, and next to the American Legion Hall is the popular Acapulco Mexican Bakery. Now at 3,700 people and counting, the eastern Iowa town is growing and thriving, Thomas says. "If you didn't have the Hispanic population here in town, yeah, we would be much more like a lot of smaller towns, and there would be a lot more storefronts that are empty," he says. And unlike other parts of the Midwest that are attracting Latino immigrants, the Hispanic population in West Liberty is not new. "I mean, we're very unique in that there's folks in this community, in the Hispanic community, that are here in their fifth and sixth generation," Thomas says. In the 2000 census, West Liberty was already well over 40 percent Latino, and has been steadily growing for decades. The first big surge in Latino immigrants arrived in the 1930s for jobs in what was then a Louis Rich turkey processing plant. That plant, now called West Liberty Foods, is still a draw for some newcomers. But most of the recent increase in the Hispanic population comes from growing, established families who came for the Louis Rich jobs, stayed and planted roots in this quiet, safe and friendly small town. Jose Zacarias is among them. The 56-year-old moved to West Liberty from Mexico in 1984, working first in the turkey processing plant, a job he said was dirty, grueling and dangerous. By learning English, he was able to get better factory jobs. They were farther away, but Zacarias continued living in West Liberty. He bought a big old farmhouse on the outskirts of West Liberty 20 years ago and raised three boys there. He called it and the two acres around him "a quiet piece of heaven" — until the new high school was built nearby a few years ago. He considers many Anglos among his closest friends, and says the white and Hispanic communities in West Liberty get along well. But he says it wasn't always this way. 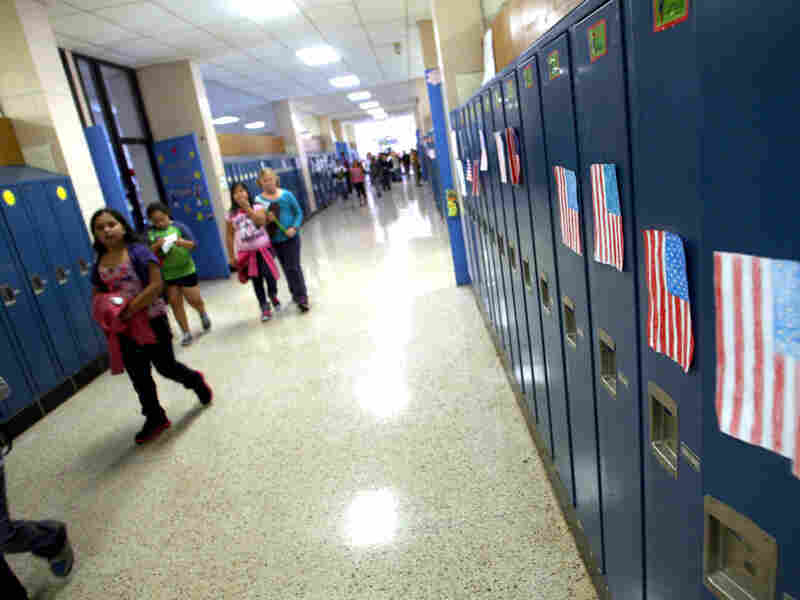 Students walk through the hallways of West Liberty Elementary School. Schools in the town were the first in the state to offer dual-language programs. "When I arrived here in '84, they told me that such and such businessman wouldn't allow it, like for instance, the bar owners, wouldn't allow Mexican customers there, or they despise them openly, or things like that," Zacarias says. But Zacarias and others in West Liberty say such conflicts gradually faded away, especially as Hispanics became more economically integrated into the community, and as the schools better integrated the community's children. The West Liberty school system has what was the first dual-language program in the state. Students take all of their classes in both Spanish and English, switching from an English-language teacher in the morning to a Spanish-language teacher in the afternoon. West Liberty Elementary School principal Nancy Gardner says the program is voluntary, with half of the spots reserved for kids who speak English primarily at home, and half for those who speak Spanish. "And in the end, all the students then become bilingual, biliterate and bicultural," Gardner says. The dual language program is now in its 14th year, and last spring graduated its first high school senior class of students who started as kindergartners. The program is so successful, several Anglo families have moved to West Liberty from nearby Iowa City, Muscatine and other towns specifically to enroll their kids. The program, which now has a waiting list, is being duplicated in a handful of other Iowa school districts with growing Hispanic populations. At a time when many communities around the country struggle with an anti-immigrant and anti-Latino backlash, West Liberty is embracing and celebrating its cultural diversity. But according to many here, including Zacarias, West Liberty is still not a bicultural utopia. "What I'm saying is we don't have an integrated community," he says. Zacarias, who was sworn in as a U.S. citizen only a few weeks ago, says this is especially true when it comes to civic involvement. For example, with local elections coming up next month, he says he recently attended a forum for school board candidates. About 30 or 40 people showed up, but he says he was the only Hispanic there. He says he is taking matters into his own hands by running for a seat on the West Liberty City Council. "We need to get together with the Hispanics and say, we are no longer a minority, we have some responsibilities, and we need to get organized," he says. "We've run out of excuses. It's time to do some work." A previous headline incorrectly characterized West Liberty, Iowa, as the nation's first majority Hispanic town. The town is the first in Iowa to be majority Hispanic.